Previously guest head chef at East London favourite P. Franco, Anna Tobias has built a career on simple but effective cookery. She was a relative latecomer to the industry – Anna studied modern languages at Oxford University before she became a chef – but the allure of the kitchen proved too much. 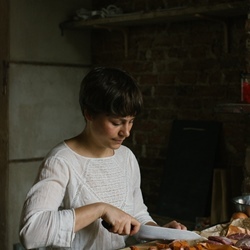 A career spent with the likes of Jeremy Lee at the Blueprint Café, Margot Henderson at Rochelle Canteen and Ruth Rogers at The River Café has made Anna one of the foremost experts when it comes to rustic, no-frills cookery, with an emphasis on traditional Mediterranean fare. If you're looking for someone to help you get the most out of simple ingredients, well, you've come to the right person.